ICOS (inducible T cell co-stimulator) is a member of the CD28 family and is expressed on the surface of activated T cells. The ICOS-ICOSL costimulatory signal regulates cellular immunity and humoral immunity. Our own-developed humanized mouse model of ICOS provides a powerful tool for further research on the efficacy, potency and adverse effects of ICOS-related drugs. ICOS (inducible T cell co-stimulator) is a member of the CD28 family and is expressed on the surface of activated T cells. The ICOS-ICOSL costimulatory signal regulates cellular immunity and humoral immunity. Our humanized mouse model of ICOS provides a powerful tool for further research on the efficacy, potency and adverse effects of ICOS-related drugs. Unlike traditional immunodeficient mice, humanized ICOS mice not only carry human ICOS, but also have a complete immune system and are therefore a more relevant, reliable, and accurate type of model. Figure 1. Generation strategy of humanized ICOS mice. 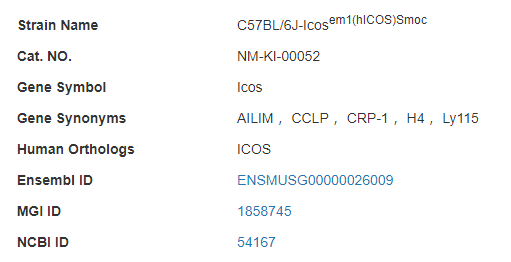 Under the C57BL/6J genetic background, the coding sequences for the extracellular domain of human ICOS and the transmembrane and intracellular domains of murine ICOS were inserted into the ATG position of the mouse ICOS gene, so that the expression of endogenous ICOS in the mouse was replaced by the expression of humanized chimeric protein. Figure2. Expression of ICOS in the activated spleen lymphocytes of humanized ICOS mice is detected by FACS. The spleen lymphocytes of heterozygous humanized ICOS mice were stimulated by anti-CD3 and anti-CD28 for 48 h, and then harvested for staining. Along with a group undergoing no stimulation, the expression of humanized ICOS was detected by FACS after antibody staining. 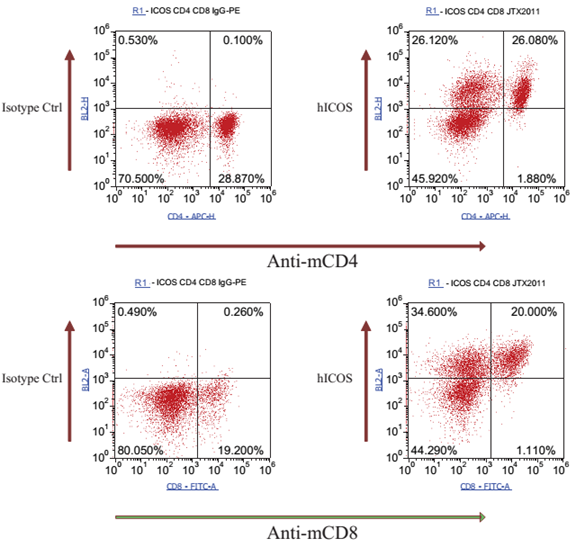 The results showed that the active expression of humanized ICOS can be detected in both activated CD4+ and CD8+ T lymphocytes collected from heterozygous humanized ICOS mice.